In paleontology, we often infer the habits and behaviors of fossil vertebrates by reference to their skeletal shape. However, it is often difficult to appreciate what those shapes are telling us: how well does shape correlate with motion? We are members of the eutheiran branch of the mammal family tree. Among many questions concerning mammal evolution, one is how did the earliest eutherian (so-called “placental”) mammals use their forelimbs? This question has important implications for how our earliest relatives got around. The earilest known members of our group are small and are often hypothesized to be scansorial (Luo et al., 2003, 2011), meaning that they are at home on the ground as well as clambering up trees.These inferences are drawn in large part from the form of the fossilized forelimb bones and their presumed functions. 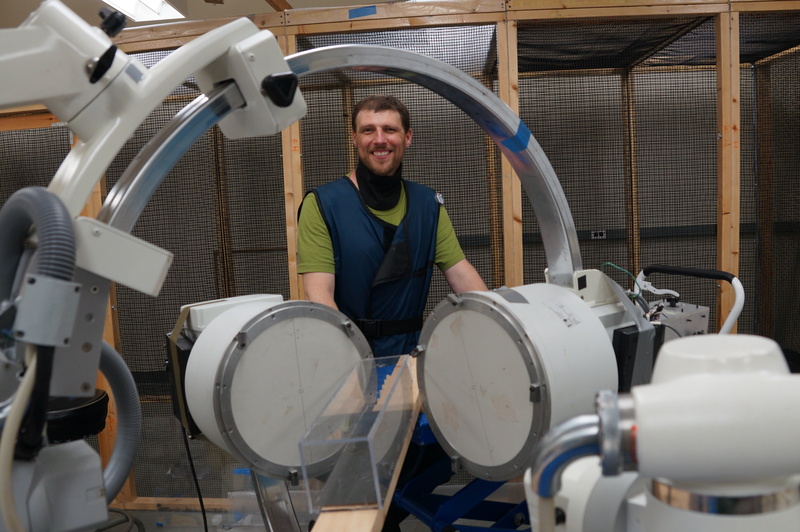 If you’ve been following this blog, you know that I have been immersed in learning XROMM (X-ray Reconstruction of Moving Morphology), a technique that combines video fluoroscopy (X-ray movies) with registration of three-dimensional bone models to yield 3-D moving X-rays. I am happy to report that my colleagues, two Stockton undergraduates (Radha Varadharajan and Corey Gilbert), and I have published an Open Access article in PLoS One that, for the very first time, reconstructs the three-dimensional movements of the long bones (humerus, radius, ulna) in the forelimb of rats. Why rats? Rats have a forelimb anatomy that is very similar in many ways to those of the earliest eutherian mammals, and as a plus, rats are scansorial. Rats are also relatively easy mammals to work with in the lab (although some days they out-clever the humans) and can be trained. As a fun side note, we named two of the rats Pink and Floyd. Our setup was straightforward — at the C-arms XROMM lab at Brown University, the rats walked along a plank of wood to a darkened hide box. 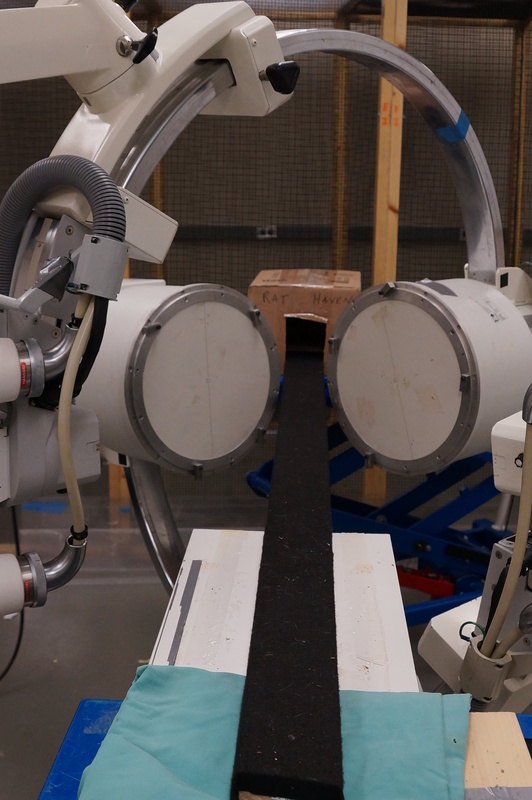 While traversing the plank, they made their X-ray cameos in two fluoroscopes connected to hi-speed cameras filming at 250 frames per second (your iPhone camera films at 30 frames per second in normal mode). When we were finished collecting our data, the rats were CT-scanned so that we could have exact three-dimensional models of their limb bones. 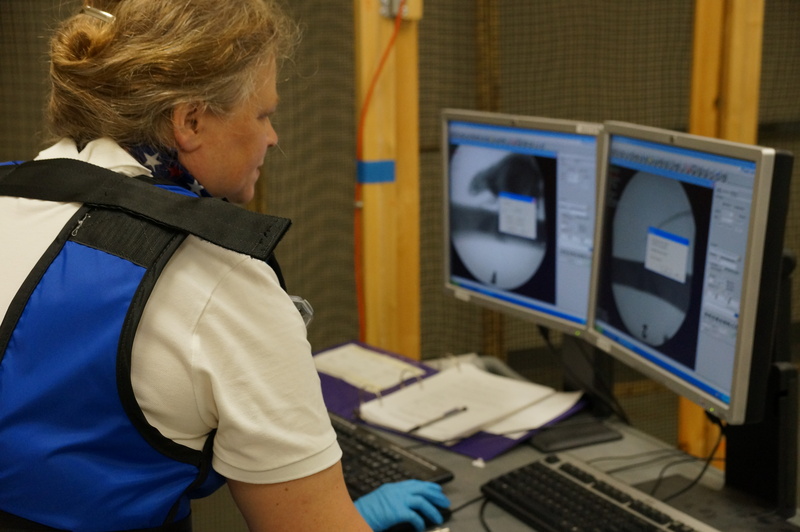 The most painstaking part was the several months it took to digitize each of our good trials. That is, using animation software, we had to match the bone models up to their X-ray shadows in the two calibrated fluoroscope movies. Once this was accomplished, our task turned to watching how the bones moved in three-dimensional space as well as analyzing the joint angle data that was generated. Our basic setup for the XROMM study — rats were trained to walk across a plank towards a dark hide box, leading them between the two videofluoroscopes. What we found both confirms previous work on small mammal locomotion, but added some interesting new insights as well. As a general rule, small mammals have a crouched posture where the elbows and knees are bent. This type of posture may aid small mammals in maneuvering around objects and keeping a lower center of gravity, which would enhance stability, especially on branches and other narrow perches. Not surprisingly and given previous work on rat locomotion, we see that these mammals do indeed walk on crouched limbs — the elbow angle, for example, never exceeded 123 degrees in full extension. By way of comparison, your elbow can be extended to 180 degrees. A figure from my book, The Bare Bones. Note how the rat has a more crouched posture whereas the cat is more upright. However, we often get the impression that mammal locomotion is similar at different scales. From cats and dogs on up, it appears that the forelimbs and hindlimbs function very much as glorified pendulums. In essence, eutherian mammal locomotion is understood as mostly two-dimensional. Although rats are small and have a crouched posture, their limb bones would be presumed to follow the pendulum model. But what the bones were doing in three-dimensions was fascinating. Both the humerus (upper arm bone) and radius (the forearm bone that aligns with your thumb) showed they were capable of long-axis rotation. Long-axis rotation is similar to the way a lathe or axle spins. Our rats’ bones certainly weren’t spinning on their long-axis, but they did show a non-trivial range of movement. A step cycle consists of a stance phase (when the hand is on the ground and forelimb is supporting the body) and a swing phase (when the hand is off the ground and the forelimb is swinging back to support the body for the next step). We found that during stance, the humerus both moves toward the midline (adducts) and rotates on its long axis towards the body. These combined movements appear to ensure that the elbow points backwards so that the forearm maintains an upright posture. During swing, the humerus moves away from the body midline (abducts) and rotates on its long axis away from the body. These combined movements seem to allow the forelimb to clear the rat’s body as the limb is brought forward to start a new step. Lateral (side), ventral (belly), and radioulnar joint (at the elbow) views of the humerus (sea green), radius (black), and ulna (red) in a typical step cycle in Rattus norvegicus. Long-axis rotation (LAR) of the radius about the ulna (radius pronation) is shown in cranial view (the rat is walking toward you) from the perspective of the ulna (the ulna appears to be stationary in the radioulnar joint view relative to the humerus and radius). Note radius (black) LAR relative to the ulna (red). Percentages = portion of the step cycle. Black bar in ventral view = body midline based on sternum. 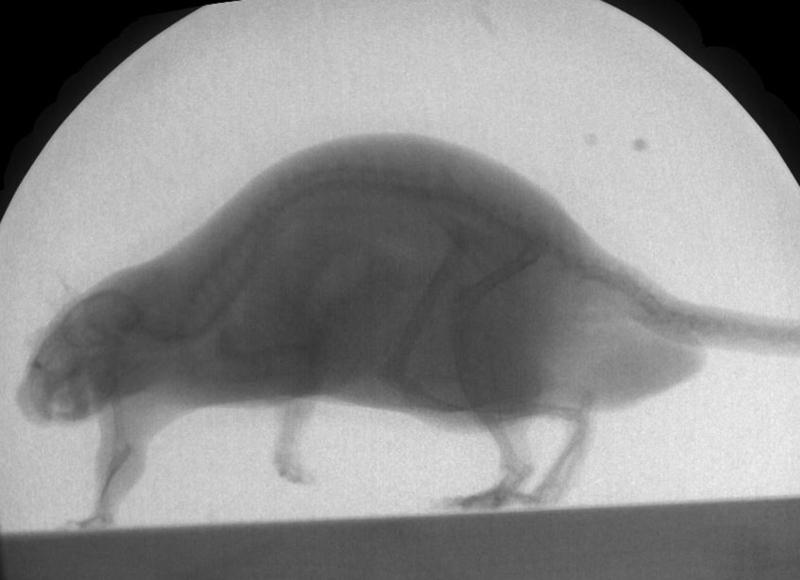 MOVIE 1 – All the rats walking betwixt the fluoroscopes with their CT-scanned bones registered to the frames. MOVIE 2 – One of our rats, “Floyd,” demonstrating a typical step cycle. What was particularly exciting to me was that we saw, for the first time in rats, the radius pivot about the ulna! In humans, we take these movements for granted: our radius pivots around our ulna with ease, directing our palms either downward (pronated) when its shaft cross over the ulna, or upward (supinated) when its shaft rotates into parallel with the ulna. Up until now, it has been unclear if the radius could move in this way to flip the hand palm-side down in rats, or whether their hand posture was maintained via positioning of the limb in general. We now know that, indeed, the radius does move and does appear to be correlated with hand placement in rats. These movements are much more subtle than in you and I (in our rats a range of 10-30 degrees of rotation), but they appear to be correlated with pronation of the hand. MOVIE 3 – One of our rats, “Floyd,” showing how the radius pivots on the ulna during a step cycle. Our research has two messages. The first message is that given the similarities in the forelimb skeletons of the earliest known eutherian mammals (Juramaia and Eomaia) to those of rats, it is likely that a similar range of movements were possible in these distant relatives on our family tree. Paleontologists studying these fossils, such as Zhe-Xi Luo and colleagues (Luo et al., 2003, 2011), have already suggested these early eutherian mammals were scansorial, and our data bolster their hypothesis. These sorts of insights are helpful in constraining when particular locomotor behaviors and movements became possible and how that might have effected mammalian evolution. The second message is that small mammal locomotion is probably not as similar to those of larger mammals as we often think, a sentiment echoed by the late Farish Jenkins (e.g., Jenkins, 1971) and by Martin Fischer and his colleagues (Fischer et al. 2002; Fisher and Blickman, 2006). Moreover, our rat data show that, at least for the forelimb, long-axis rotation plays a role in normal overground movement. 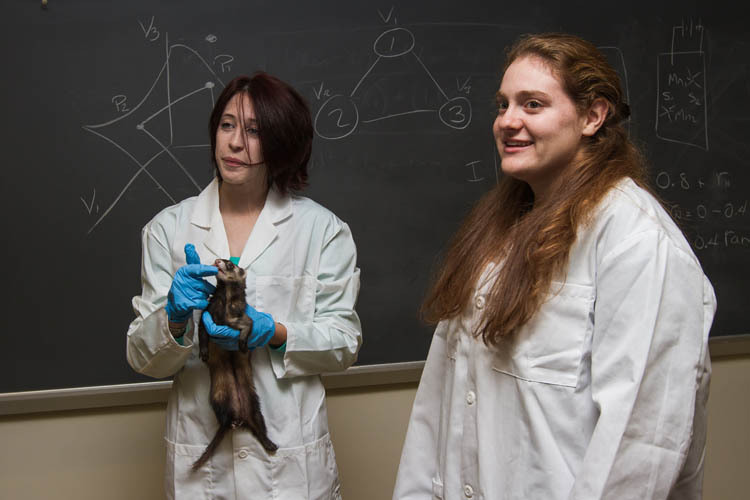 We hope our study provides another perspective on small mammal locomotion and encourages new and fruitful research in our furry friends past and present. I am grateful to my colleagues and former students for their help and work on this project. I want especially to thank Elizabeth Brainerd (Brown University). 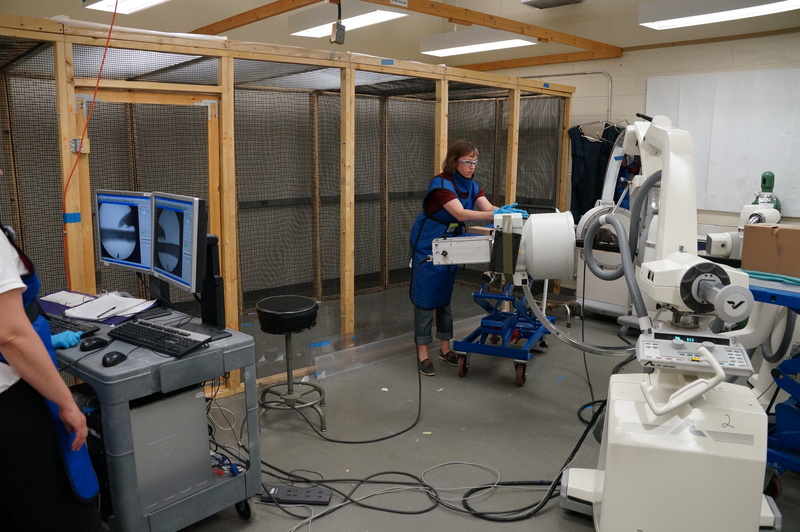 She has been a source of encouragement and a patient teacher to an old dinosaur learning new tricks, and her help with learning XROMM and on designing the experiment which led to this paper (my first foray into animal kinematics) was invaluable. Fischer, M. S., and R. Blickhan. 2006. The tri-segmented limbs of therian mammals: kinematics, dynamics, and self-stabilization—a review. Journal of Experimental Zoology Part A: Comparative Experimental Biology 305A:935–952. Fischer, M. S., N. Schilling, M. Schmidt, D. Haarhaus, and H. Witte. 2002. Basic limb kinematics of small therian mammals. The Journal of Experimental Biology 205:1315–38. Jenkins, F. A. 1971. Limb posture and locomotion in the Virginia opossum (Didelphis marsupalis) and in other non-cursorial mammals. Journal of Zoology, London 165:303–315. Luo, Z.-X., Q. Ji, J. R. Wible, and C.-X. Yuan. 2003. An Early Cretaceous Tribosphenic Mammal and Metatherian Evolution. Science 302:1934–1940. Luo, Z.-X., C.-X. Yuan, Q.-J. Meng, and Q. Ji. 2011. A Jurassic eutherian mammal and divergence of marsupials and placentals. Nature 476:442–445. Given the positive feedback and interest in our POV of a ferret running on a treadmill, we’ve upped the ante here at the Best Feet Forward lab. We proudly present two more GoPro POV movies of our magnificent animals running for science. Would you like to see a running Bearded Dragon (Pogona vitticeps) and lab rat (Rattus norvegicus)? Of course you would. Above you see Greenbeard running for science. We’re shaking a tasty bucket of crickets off-camera to get him to run. Above you see one of our lab rats, Frank, also running for science. If you look closely you can see the reflective beads attached to him that we follow with the infrared OptiTrack camera system. Bridget Kuhlman is once again thanked for her brilliant camera work. The BFF Lab Students and Faculty in the Spotlight! I am excited to report that the Best Feet Forward (BFF) Lab has had its first local news story! Susan Allen at the Office of News & Media Relations at Stockton College has written a wonderful article that was distributed to the associated press today. We thank Susan for this wonderful story, which we reproduce here in this post (see below). All photos are copyright Susan Allen / The Richard Stockton College of New Jersey. 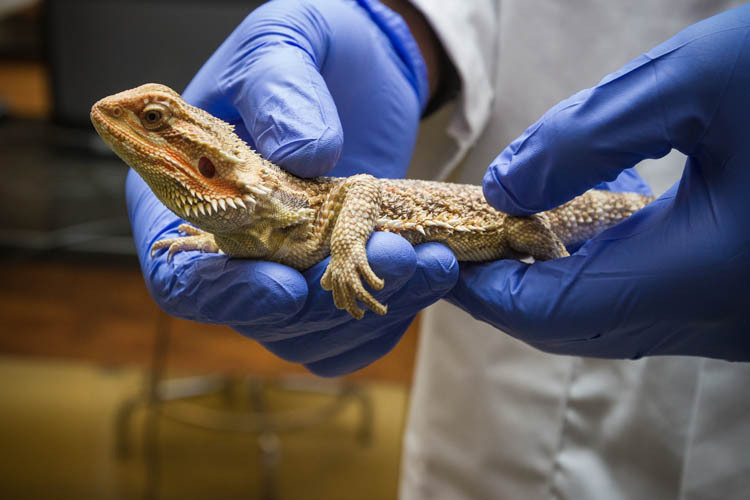 Galloway Township, NJ- Caleb Bayewu, a junior Biochemistry major, cradled a bearded dragon in his hands as Cory Barnes, a senior Biology major, attached tiny reflective beads to the bumpy skin on the patient reptile’s forearm. Black Beard, as the lizard is nicknamed, is one of three juvenile bearded dragons at The Richard Stockton College of New Jersey taking part in an animal locomotion research project aimed at better understanding how dinosaurs once moved across our planet. After body measurements were recorded, Black Beard was placed on a treadmill surrounded by a system of three infrared cameras and plastic containers that serve as safety nets in case a reptile runner strays off course. As soon as Bayewu shook a clear jar of jumping crickets, Black Beard sprang into action. 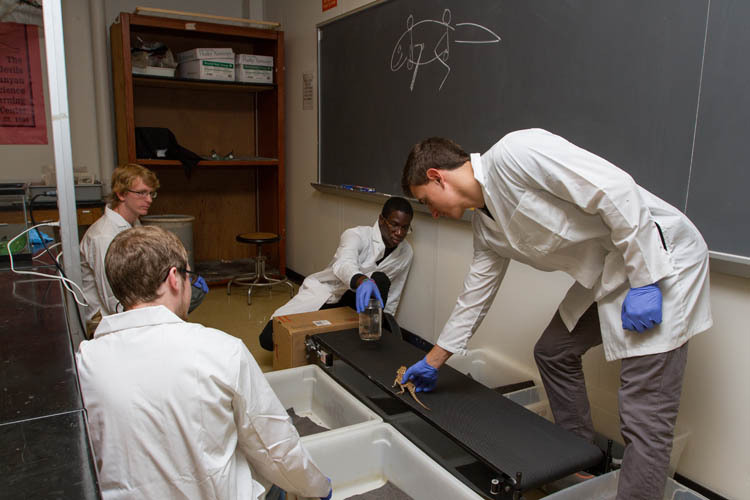 Alex Lauffer, a junior Biology major, flipped the conveyor belt switch, the treadmill kicked on and the cameras began transmitting data to Dr. Matthew Bonnan, associate professor of Biology, and Dr. Jason Shulman, assistant professor of Physics. Sophomore Biology majors Kieran Tracey and Alex Hilbmann stood close by, making sure Black Beard stayed on the treadmill. While Black Beard ran in place, the cameras captured the motion of each reflective bead sending real experimental data at the overwhelming rate of 120 frames-per-second to a computer program that can read and display the data as moving dots. From behind their monitor, Bonnan, of Hammonton, and Shulman, of Egg Harbor Township, watched each step on their screen. “Without a time machine, we can’t put dinosaurs on a treadmill,” said Bonnan, who has been fascinated with dinosaurs since he was 5 years old. 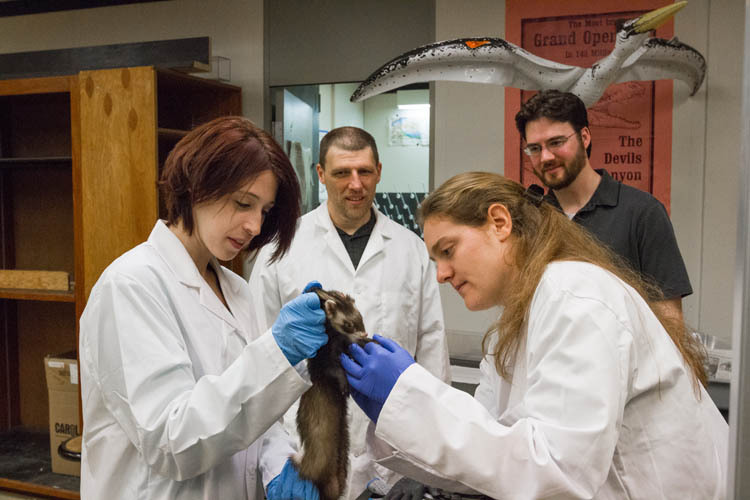 Instead, bearded dragons, ferrets, rats and a Savannah monitor are “standing in for their ancestors” at the Best Foot Forward (BFF) Laboratory on the main Galloway, NJ campus. “Given that the earliest mammals and dinosaurs had a forelimb posture not unlike lizards, they are acting as a model to test hypotheses about the transition from sprawling to upright forelimb postures,” said Bonnan. The fossil record offers scientists a motionless slice of history. Bonnan and his team have turned to optical tracking technology to tell more of the story. “Our ultimate goal is to realistically model and place constraints on how fossil vertebrates, such as dinosaurs and early mammals, moved their forelimbs,” Bonnan explained. The team is quantitatively illustrating the motion of modern day reptiles and mammals and using bone shape as a common denominator to make comparisons between their laboratory stand-ins and dinosaurs. Step-by-step, his vision is coming to life with the support of colleagues, student researchers and staff within the School of Natural Sciences and Mathematics. To model motion, math and physics come into play. Bonnan’s friend and colleague, Dr. Jason Shulman, joined the team lending his numerical analysis expertise. “Jason Shulman is a big part of why we’re able to do this. Without him, interpreting the data would be difficult at best,” said Bonnan. Early in the Physics curriculum, students learn to calculate angles and speed, which means that undergraduates are prepared to take part in real research outside of textbook exercises Shulman said. Sometimes Physics majors wonder why they need to study Biology and vice versa. The animal locomotion research is an example of how the sciences work together. “It’s important for students to understand concepts outside of their field—that’s an important lesson I hope we convey. 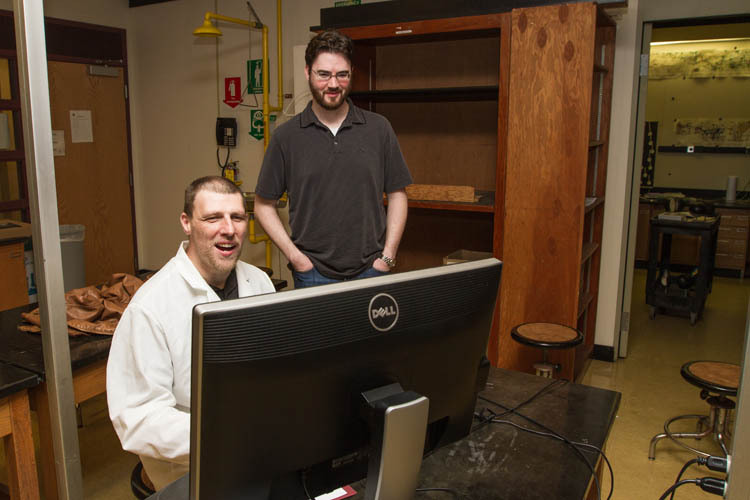 The interdisciplinary collaboration is perfect for Physics students,” said Shulman. The bearded dragons were donated to Bonnan by student Kiersten Stukowski, of Gloucester in Camden County. Scientists rarely have the opportunity to work on a long-term project with the same specimens as they mature explained Bonnan. 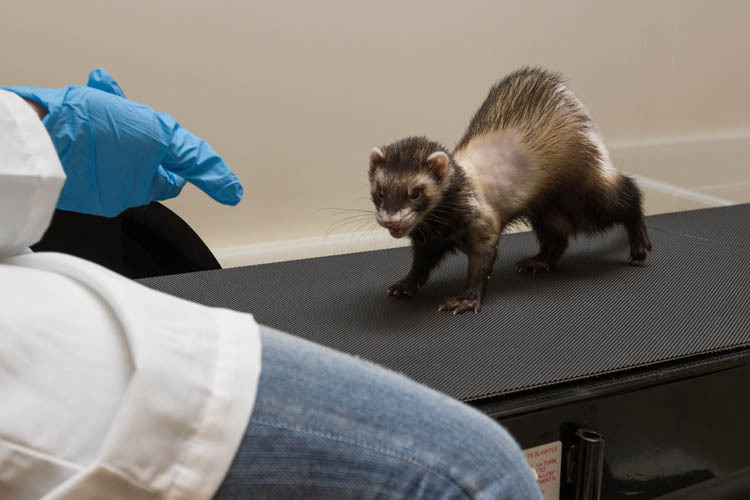 Justine Ciraolo, director of Academic Laboratories and Field Facilities, connected Bonnan with her sister, who is loaning her ferrets to the team. When the reptiles and mammals aren’t in the lab, they are cared for by John Rokita, principal animal health lab technician, who has been instrumental in acquiring specimens for Bonnan. “None of this would have been possible without the support of the School of Natural Sciences and Mathematics and Stockton’s Institutional Animal Care and Usage Committee. It is rare for undergraduates to get this experience. On every level this is teamwork and everyone has been incredibly helpful,” said Bonnan. 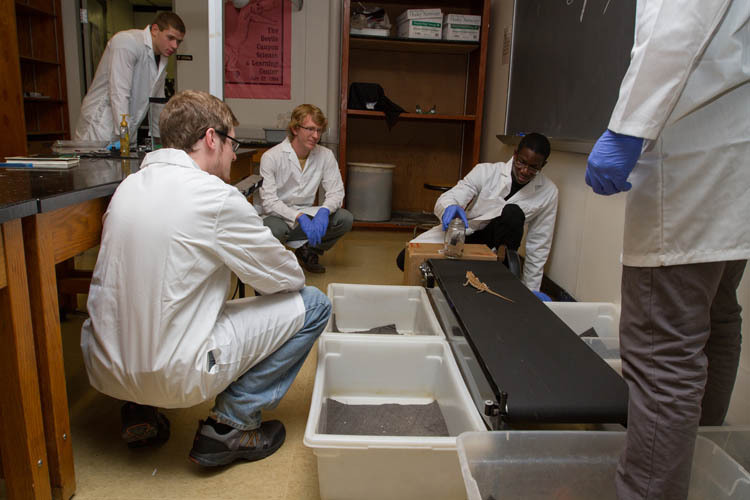 Alex Hilbmann, a sophomore Biology major, of West Deptford in Gloucester County, says he’s learned all about lizards while building a foundation to better understand the kinematics (or science of motion) during his independent study. “It wasn’t always easy to get them to run,” he admitted. Hilbmann plans to go on to medical school after Stockton. 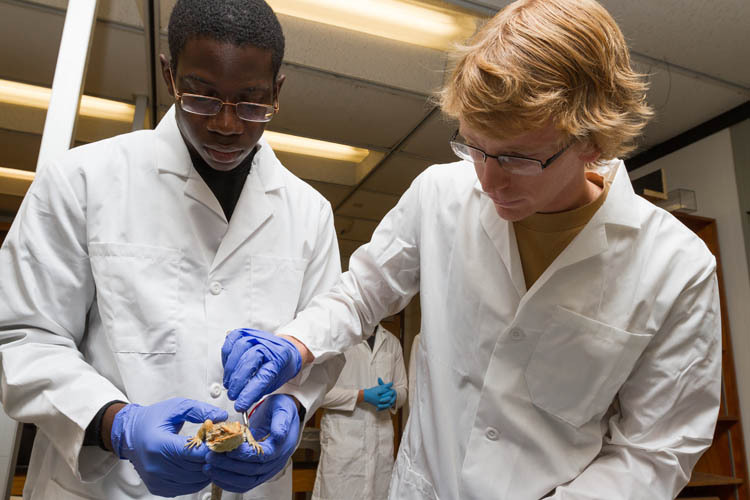 Caleb Bayewu, a junior Biochemistry major who’s from Maywood in Bergen County, started out working with rats on the treadmill, but “they didn’t always want to move.” Since he joined the team, he’s witnessed the differences in movement among different species. Corey Barnes, a senior Biology major, of Seaville in Cape May County, took Comparative Anatomy with Dr. Bonnan, which he says opened up his interest along the evolutionary tree. The research has really illustrated “how different their walking habits are.” Barnes is a veterinary technician at Beach Buddies Animal Hospital in Marmora and hopes to attend veterinary school. Alex Lauffer, a junior Biology major, of Point Pleasant in Ocean County, has always had an interest in dinosaurs and reptiles. The research project was “right up my alley,” he said. The aspiring veterinary assistant has three snakes, one tarantula, one dog and a pond of koi fish. However, it was in the BFF Lab that he held his first bearded dragon. They are surprisingly calm, he said. 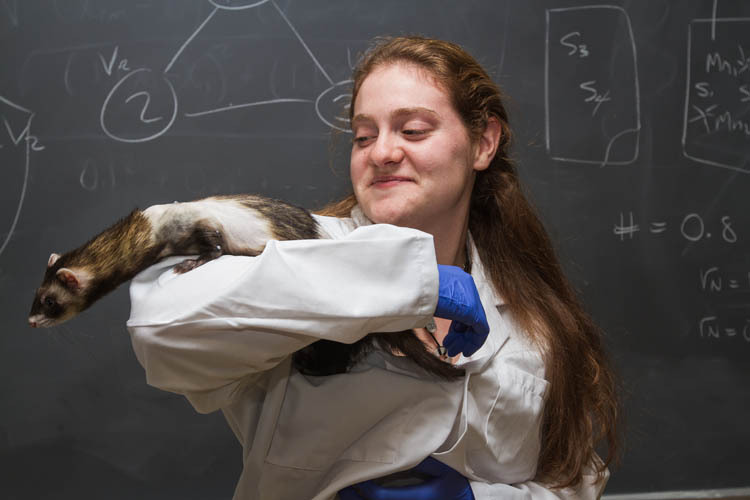 Bridget Kuhlman, a senior Biology major, of Little Egg Harbor in Ocean County, said, “It’s a dream come true being able to work with ferrets. It’s getting me ready for vet school,” she said. She works as an EMT and personally owns five ferrets. Kelsey Gamble, a senior Anthropology and Biology major, of Williamstown in Gloucester County, said, “Working with live animals is an interesting experience. It’s a lot different than my anthropology work,” she said. “We are looking at the forelimbs and how they move.” The search for patterns and constructing relationships between form and function blend her Biology and Anthropology interests. My lab, the Best Feet Forward (BFF) Locomotion Lab, now has it’s own page and a Twitter account, @BFFLocomotion. Follow us as we follow animals in motion! Just a short post to introduce you to some of the “newer” students in the Bonnan Lab: Kelsey Gamble and Caleb Bayewu. Kelsey Gamble with Peter the rat, showing off the vest she designed for tracking our furry friends. 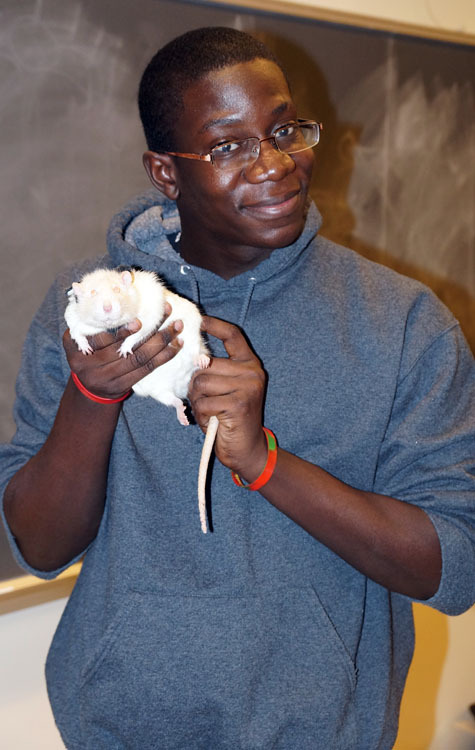 Undergraduate Caleb Bayewu with another rat we dubbed Jabba. Today we were working with some Sprague-Dawley rats to track how much their forelimb is abducted at the elbow (pulled away from the side of the body) during locomotion. We use an apparatus called the OptiTrack V120 which consists of 3 integrated infrared cameras that send out rapid pulses of IR light. 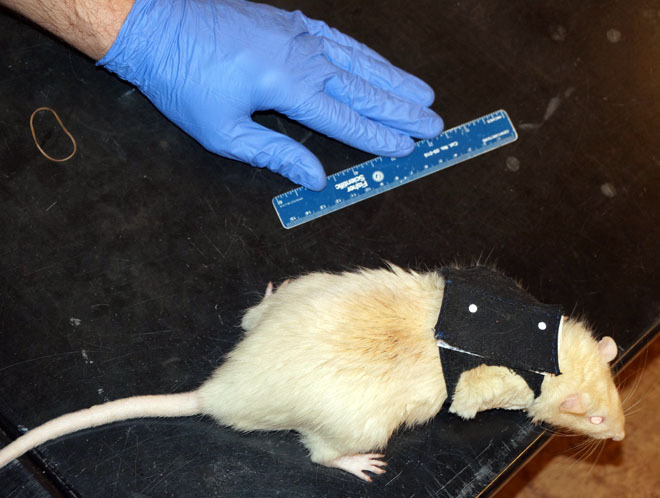 The rats wear a vest with two markers on the back which gives us the position of their body’s mid-line, and another small marker is affixed to their elbow (with the equivalent of eyelash glue) … with tender loving care, of course. 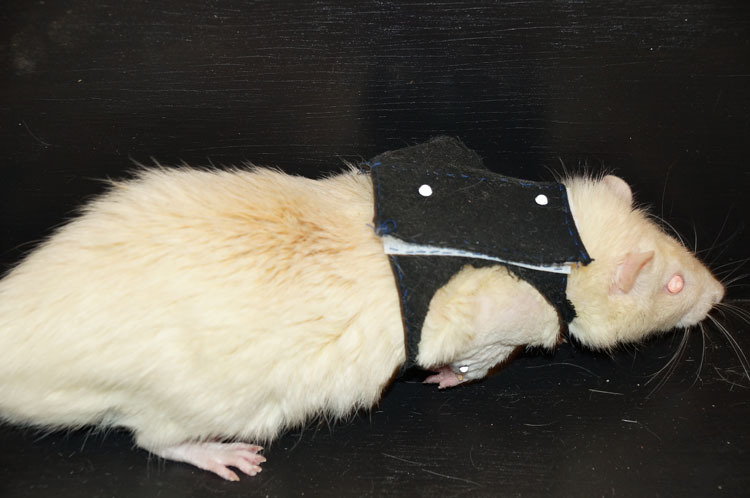 Peter the rat walking along his track, showing off his tracking vest and the tracking marker on his elbow. 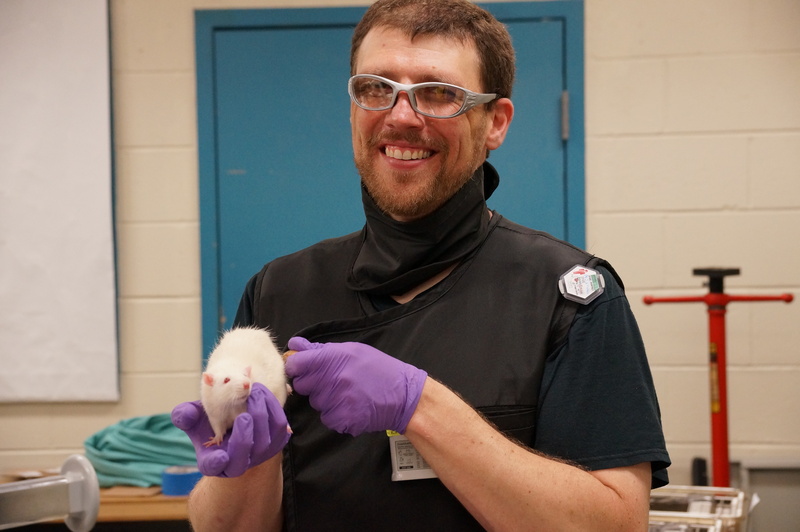 Peter the rat was more interested in exploring the lab than being measured for science. Okay, so I’m the “old dinosaur” here, although I was informed recently that I could still pass as a graduate student. I am happy to report that I am back on the campus of Brown University this week with one of my undergraduates, Radha Varadharajan, to begin what I hope to be the first in a long series of studies on the evolution of amniote (reptile, bird, mammal) forelimb posture. 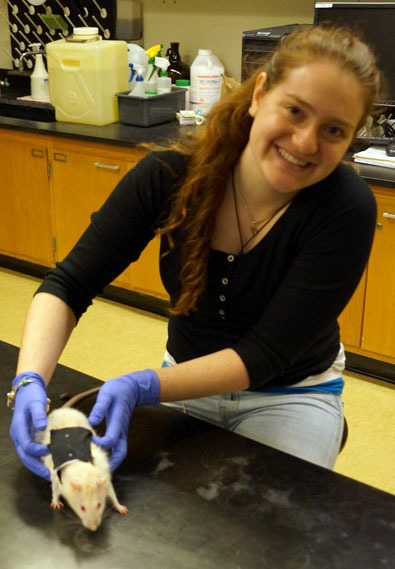 We (my “rat pack” students and I) are using the XROMM technology I have detailed here on this blog to understand how the three-dimensional movements of the forelimb bones of rats actually occur. The long-term goal of this initial study is to document how these movements facilitate hand placement and posture, and how these details of locomotion are related to bone shape. My ultimate goal is to use the somewhat primitive forelimb posture of rats as a template to understand how some early fossil mammals may have moved. 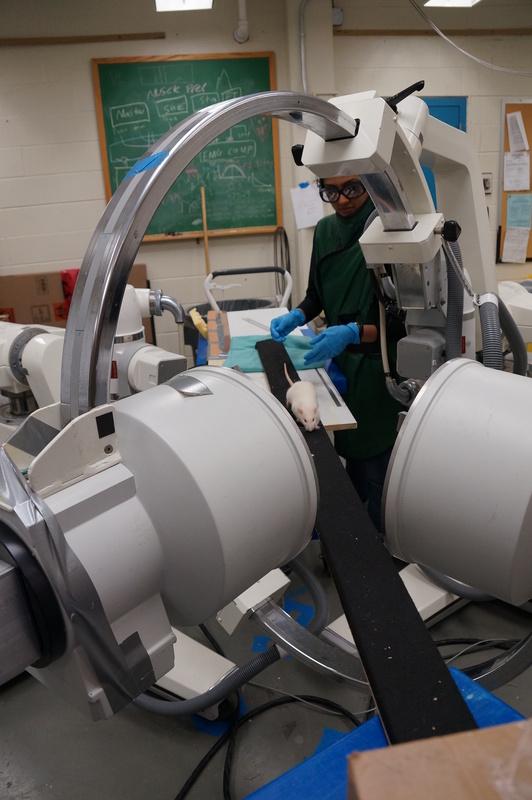 Today, Radha and I, under the tutelage of Dr. Elizabeth Brainerd, began the process of setting up the so-called C-arm fluoroscopes that will allow us to take calibrated X-ray movies of a number of rats as they walk, run, and perhaps do other activities that we happen to capture. This was especially exciting and informative for me, because these are the “new tricks” this “old dinosaur” wants to learn. Tomorrow, we begin in earnest filming the skeletal movements of the rats. 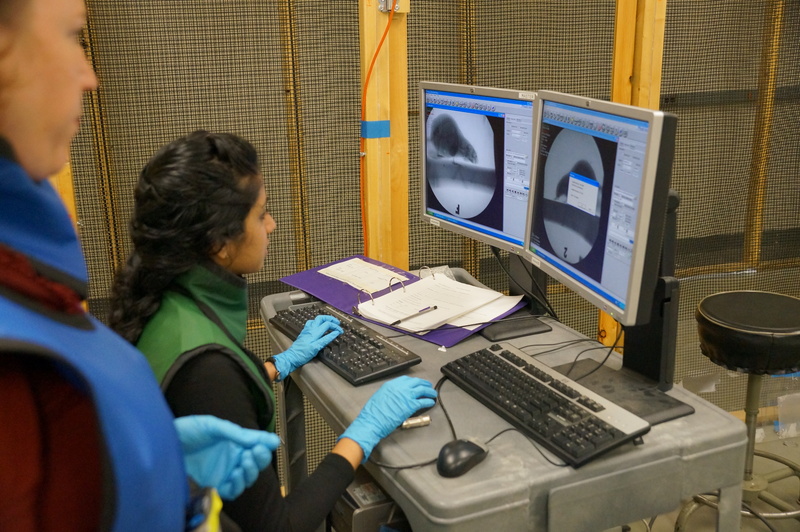 You will notice in the pictures posted here that Radha and I are suited up in lead aprons and thyroid collars because, as you might anticipate, we do not want to expose ourselves to X-ray radiation during the data capture. In fact, she and I have participated in numerous safety trainings and tests to ensure we stay safe. Here I am behind the two C-arm fluoroscopes. In front of the scopes, you can spy the wooden plank walk-way for the rats, and an acrylic box that the rats will walk or run through in the vicinity of the X-ray fields. 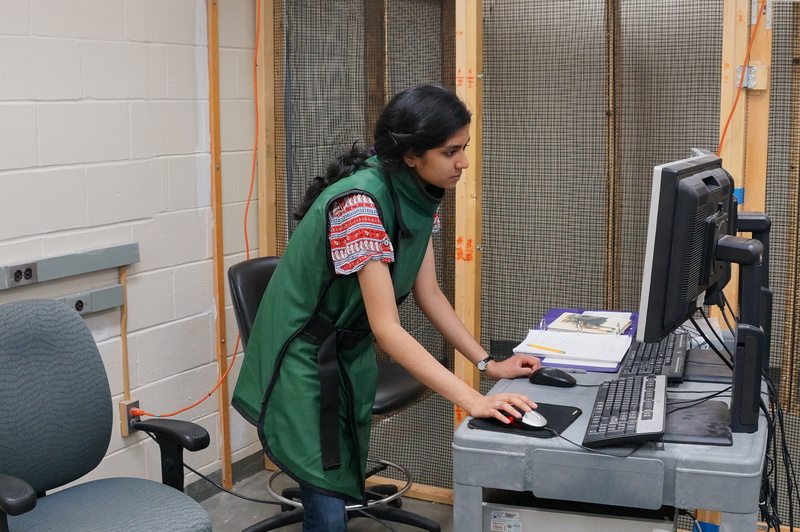 Here is Radha learning x-ray capture at the Brown C-arms lab. We also spent time today with Dr. David Baier learning how to set up what is called a rig in the MAYA software program that will later animate the skeletons of the rats we film. Essentially, a rig in this case means creating a joint system that can be calibrated with the X-ray films and “attached” to the 3-D bone geometry from CT-scans of the rats used in the study. I further shook some of the rust out of my head reviewing and practicing how to import calibrated data from X-ray digital movies and syncing them with 3-D bone geometry — skills I first acquired almost one year ago during Brown’s 2012 XROMM course. All of this setup and learning is key for me and my students, not only because we want to do the science right, but also for other reasons I shall divulge in future posts. Everyone at Brown has once again been incredibly helpful, and I am especially indebted to Dr. Brainerd for her encouragement and help over the past year with XROMM.